Hello loverlies! 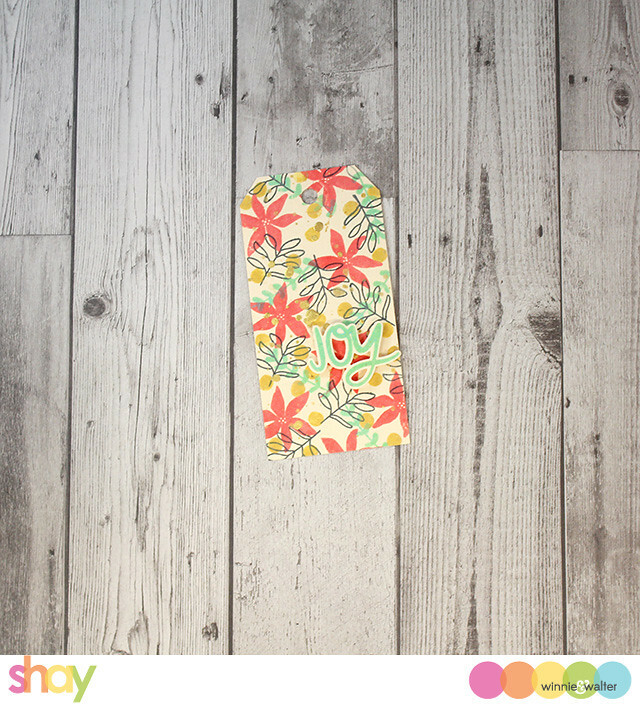 It is Shay here today with a very fun post. 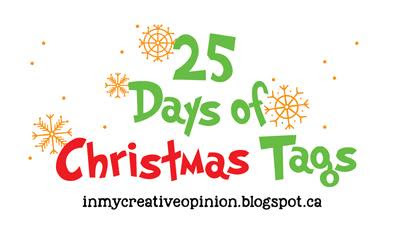 Tracey McNeely has a wonderful event called The 25 Days of Christmas Tags in which for 25 days she features Christmas tags. There are lots of guests and giveaways along the way! One of the first things I learned to stamp was tags so this is near and dear to my heart. As I mentioned in our Rerun post this month featuring for In Bloom: Frenchy's Festive Florals with Angelica Suarez, when I have several projects to work on at once I like to use the same materials and see where that leads me. I actually began by stamping on a manila tag using In Bloom: Frenchy's Festive Florals with Angelica Suarez with abandoned coral, fossilized amber and cracked pistachio Oxide Distress Inks and black jack along with flicking some gold spray. I stamped "joy" onto a manila tag and cut it out using the coordinating cutaway and adhered it to the tag using foam dimensional adhesive. This tag inspired me to create the same background with the stamp set and I used abandoned coral, fossilized amber and cracked pistachio Oxide Distress Inks and black jack along with flicking some gold spray on a piece of white cardstock. On a couple of larger manila shipping tags in black jack I stamped the solid woodgrain from Scenery: Into the Woods and then adhered a strip of the stamped background to the bottom of the tag and then also added a scalloped border cut using Georgette Border Cutaways over the seem. Lastly, I stamped the sentiment from Sentimental: Winter in cracked pistachio. Hope you get inspired to make some tags! Kelly has an awesome tag for you HERE. Don't forget to visit Tracey's blog HERE to get more details, inspiration and enter tons of giveaways including one from w&w! 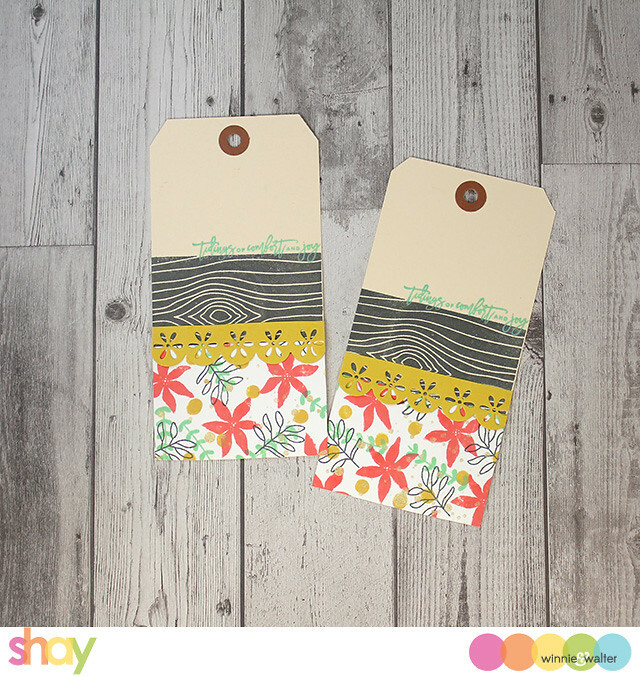 Lovely tags - I really like that pretty strip of wood grained patterned washi! 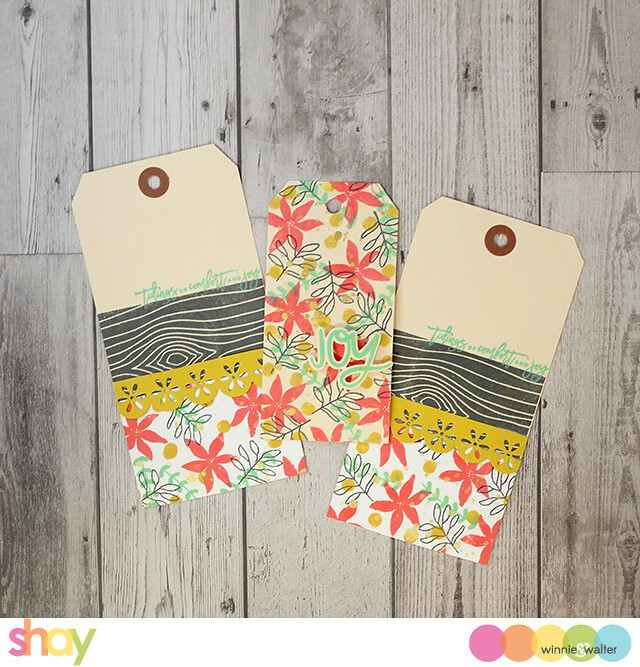 Beautiful combination of colours/images on your tags, Shay! The sentiment, in Cracked Pistachio, is really pretty! Thank you so much for being a generous sponsor of this event; I LOVE the new sets you shared with us! Loved using them on my tags and look forward to doing so on my cards. I think the accompanying dies may also have to join my collection...shopping list started! Such beautiful tags; I love all the detail. Nice tags. They manage to suggest Christmas while highlighting some non-traditional colors and elements. Thans for the detailed description. Oh Shay, how cute are these? Well done and Thanks for sponsoring this event. reminder. The tags are great. These are the cutest!!!! I love the colors and design! Just wonderful tags. Thanks for the inspiration! Happy Holidays! So modern & beautiful--love your tags, Shay! This is such a fun event and my first year taking part in it. Your poinsettia tags are lovely, and something not too difficult for me to recreate. I love the flowers stamped in the abandoned coral, especially on the manila tag. Thanks for being a part of this event! Awesome stamps and very cool tags, Shay. I love the stamped background. 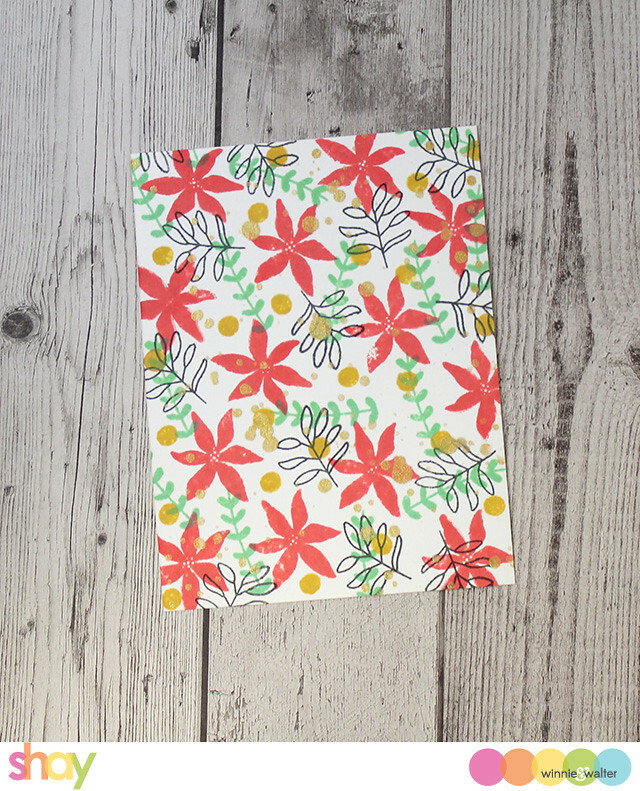 It looks like patterned paper, only better. Thanks for inspiring us! Gorgeous tags! So creative and festive. Love the fresh designs. So creative and beautiful! Thanks for being a super sponsor!